This issue was a bit tricky but not THAT tricky, though. 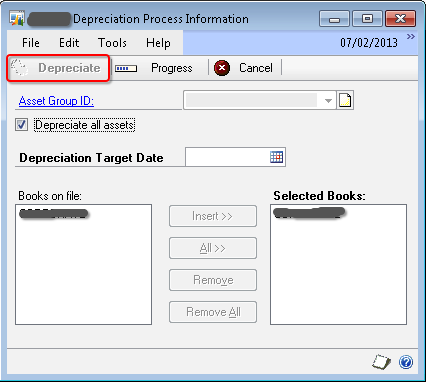 Reason: After quite a bit of analysis (Dex Script Log & SQL Profiling using SDT), I found that there is a table where FA module temporarily records the depreciation activity initiated by any user and will retain that record the process is complete. User confirmed to me that last time when he ran the depreciation process, it got stuck at the time of printing the results. The table which records the activity is FA40203 (display name: Book Setup for Depreciation). The table contains three fields: User ID, FA Book Index & FA Book ID. I took a backup of this table (a simple T-SQL SELECT * INTO…) and removed that stranded activity record for that user. User confirmed that he could then start depreciation process. Its always good to start a day with some brainy troubleshooting. But not certainly good for users to start with an issue, though. Fixed Assets Suffix is quite confusing, at least that’s what I was thinking about. When you enter an asset ID, you also must enter a suffix for it. The asset ID is used throughout Fixed Asset Management to identify assets; the suffix is used to identify components of assets. The default suffix is 1. You can accept the default suffix or enter or select a different one. For someone who do not understand what exactly it is, I would like to simplify. Asset Suffix will be incremented as and when you do a partial transfer. It is not advisable to use Asset Suffix for non-identical assets. For instance, if you purchase 10 laptops but non-identical configurations, it’s not standard practice to create one asset ID with quantity 10.